In our recipe card, Caity and I wanted to focus on the texture of the quesadilla. Would it be chewy or gooey on the inside and crisp on the inside? We wanted to make sure that it wasn't completely soft on the inside or outside, not melted at all, or chewy and hard. I looked at the science behind finding the right, melty cheese. I found that casein, a type of protein in milk that includes micelles, is important to finding the meltiest cheese because it includes calcium. These micelles hold up to 2/3 of the calcium in milk. How can we measure the qualities and desirability of a finished recipe both quantitatively and qualitatively in order to determine the success of our recipe experimentation. If you wanted to measure how many people liked the finished recipe, you could use a quantitative test such as a survey and use the results to make a graph. For example, if you wanted to know how desirable the pizza is that you made, you could have people taste test it and fill out a survey. The results from this survey could help you produce a chart or graph to present how desirable your recipe is. If you wanted to measure the quality of the finished recipe, you could create a scale from 1-100% and have people taste test your recipe, if they really enjoyed it but felt that it could be improved they could rate it an 80%. If they loved it and thought it tasted like heaven, they could rate it a 100% but if they think the total opposite, they could rate it a 2%. This would show the quality of your final recipe. I think that the only difference between food and science is that in science you are using a lot of chemicals and elements that take even the slightest change to effect it completely. Whereas, if you were to put the slightest amount more of salt in a cake, then it won't completely change it too the point where it isn't edible anymore. They are similar because they both have a "recipe" or rules of how much of certain substances or ingredients can go into the mixture, and they both have something that these ingredients added together make. I think a cook and scientist are similar because they are always experimenting and trying something new with their ingredients. They are constantly modifying the recipes to have new or improved outcome. They both use heat and cold to change the properties of their mixtures. But they are also different because a scientist works in a lab and a cook works in a kitchen, a scientist uses ingredients that can result in food, something life threatening, or toxic and a cook uses ingredients that can result in food, can get you sick, or can taste gross. Most Reliable and Least Biased: http://www.moneycrashers.com/hybrid-cars-pros-cons/​ This source is least biased to me because it is just about informing buyers of what the pros and cons are of hybrid cars. They aren’t trying to force you to buy hybrids. 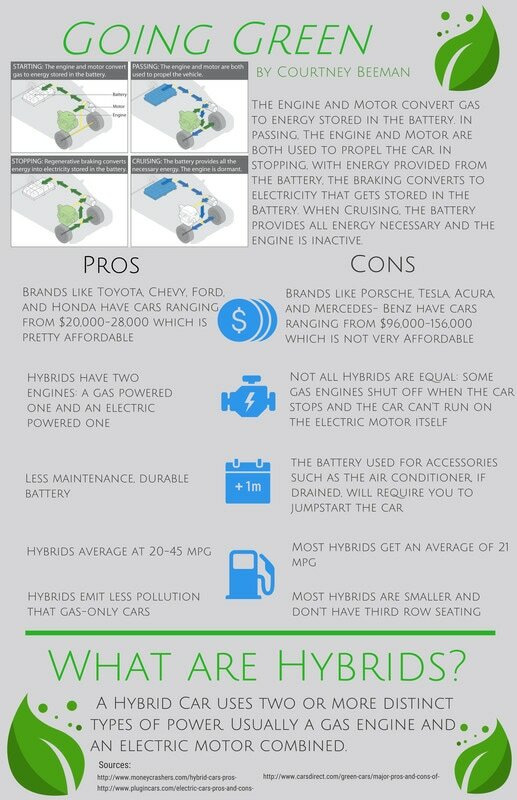 But there are more pros than cons which could make it seem more biased towards hybrids. I would say this source is reliable because it has been featured in CNN, Forbes, The Wall Street Journal, etc. so it has been used for other topics other than hybrids. I think that this source is pretty reliable because it is a website focused on cars but it can also be a little bit biased because it shows more pros than cons and shows that there was more effort put in to find and support the pros than the cons. This source is really reliable because it had some really good points on the pro and con sides and they had a balance of both. I would say that it is the most biased source because its main focus is hybrid and electric cars so it may try to urge you to buy hybrids or electric cars. 2. Classify all of the sources cited on your infographic as primary, secondary or tertiary. Explain the rationale for your classification for each source. All of the sources I used were secondary sources because they were all articles that were not published in a peer-reviewed scientific journal like most primary sources and none of them referenced another source like tertiary sources do. 3. Read over the Abstract from one of the primary sources you used. If you did not consult a primary source for your infographic, find one that is related to your topic and use it for this question. 3.a. ​Who are the authors of this paper, what journal is it published in and when was it published? 3.b.​ Summarize the key points from the abstract. There are many different types of hybrid technology available to car makers, the pros being saving money and helping cut emissions, and the cons being that it’s more expensive to produce a hybrid than a regular car and each hybrid is different in size and gas mileage. 3.c.​ Based on this abstract, what do you think the purpose of an abstract is and what information do you expect to find in the abstract of a scientific journal article? I think the purpose of this article is to show what types of hybrids are out there and to state what the big pros and cons are for hybrids.